Thanks for your patience during 2018 paving season. Pavement repairs and paving took place at 12 locations. Click here to see the street-repair map at full size. If you have questions, leave a message at (503) 635-0261 and we will return your call — or email pavement@ci.oswego.or.us. Please include your street address. 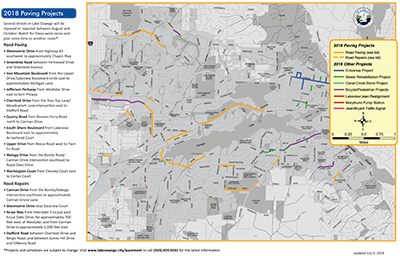 See a map of street repairs.